, an English prelate, son of sir Walter Bagot, bart. 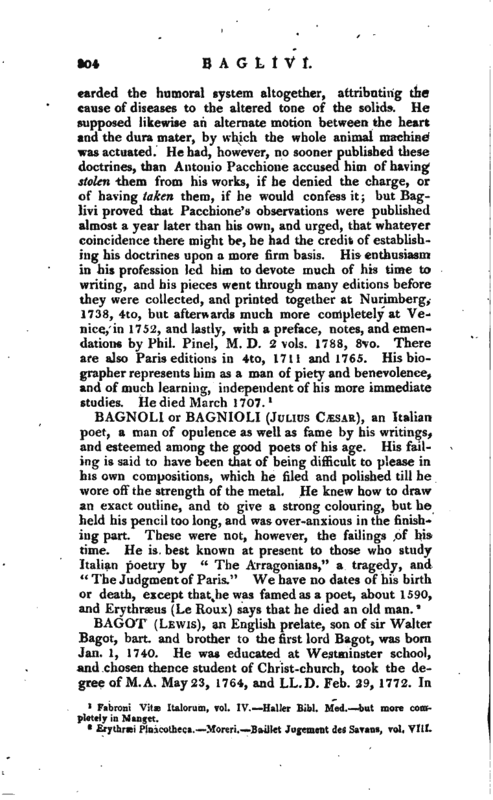 and brother to the first lord Bagot, was born Jan. 1, 1740. He was educated at Westminster school, and chosen thence student of Christ-church, took the degree of M.A. May 23, 1764, and LL.D. Feb. 29, 1772. In | In 1771 he was made canon of Christ-church in the room of Dr. Moore, the late archbishop of Canterbury, and the same year he married Miss M. Hay, niece to the earl of Kinnoul. He was installed dean of Christ- church, Jan. 25, 1777, on the translation of Dr. Markham to the see of York, about which time he resigned the livings of Jevington and Eastbourne in Sussex, in favour of his nephew, the Rev. Ralph Sneyd. In 1782 he was promoted to the see of Bristol, translated to Norwich the year following, and thence to St. Asaph in 1790, where he rebuilt the palace on an uncommon plan, but necessary for the situation, where, among the mountains, and in the vicinity of the sea, storms are often violent. The palace, therefore, is low; and being on the assent of a hill, the vestibule, dining-room, and drawing-room, which occupy the whole front of the building, are on a level with the first floor in the other apartments, two of which, on the ground-floor, are a neat domestic chapel and a library. 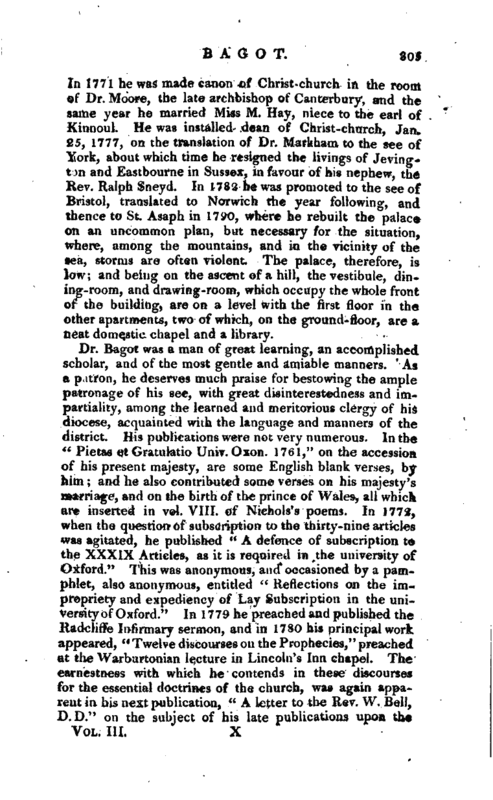 Dr. Bagot was a man of great learning, an accomplished scholar, and of the most gentle and amiable manners. As a patron, he deserves much praise for bestowing the ample patronage of his see, with great disinterestedness and impartiality, among the learned and meritorious clergy of his diocese, acquainted with the language and manners of the district. His publications were not very numerous. In the “Pietas et Gratulatio Univ.Oxon. 1761,” on the accession, of his present majesty, are some English blank verses, by him and he also contributed some verses on his majesty’s marriage, and on the birth of the prince of Wales, all which are inserted in vol. VIII. of Nichols’s poems. In ]772, when the question of subscription to the thirty-nine articles was agitated, he published “A defence of subscription to the XXXIX Articles, as it is required in the university of Oxford.” This was anonymous, and occasioned by a pamphlet, also anonymous, entitled “Reflections on the impropriety and expediency of Lay Subscription in the university of Oxford.” In 1779 he preached and published the Radcliffe Infirmary sermon, and in 1730 his principal work appeared, “Twelve discourses on the Prophecies,” preached at the Warburtonian lecture in Lincoln’s Inn chapel. The earnestness with which he contends in these discourses for the essential doctrines of the church, was again apparent in his next publication, “A letter to the Rev. W, Bell, D. D.” on the subject of his late publications upon the | authority, nature, and design of the Lord’s Supper,“1781, 8vo. In this Dr. Bagot objects to the Socinian tendency of Dr. Bell’s arguments and about the same time he reprinted, with a short preface, Dr. Isaac Barrow’s” Discourse on the doctrines of the Sacrament," which is now one of the tracts dispersed by the Society for promoting Christian Knowledge. His other publications were, a sermon before the house of lords, Jan. 30, 1783 one for the Norwich hospital; and two others before the Society for promoting Christian Knowledge, 17 88, and the Society for propagating the Gospel, 1790. 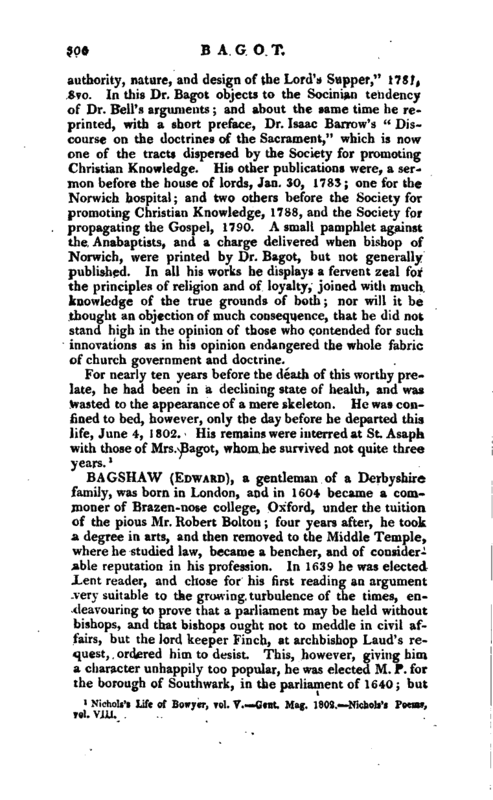 A small pamphlet against the Anabaptists, and a charge delivered when bishop of Norwich, were printed by Dr. Bagot, but not generally published. In all his works he displays a fervent zeal for the principles of religion and of loyalty, joined with much knowledge of the true grounds of both nor will it be thought an objection of much consequence, that he did not stand high in the opinion of those who contended for such innovations as in his opinion endangered the whole fabric of church government and doctrine.